Linnaea's is one of the city's premier venues for live music, and hosts events every night except Mondays. Some nights are reserved for poetry, story telling, artist receptions, weekly jazz jams, and monthly folk music jams. Here's our calendar. Most performers, particularly those new to Linnaea’s, play for tips, CD sales, coffee, and dessert. Four acts per month are paid $50.00, and those slots are booked up 3-5 months in advance. Linnaea’s has no PA system or sound gear, so most musicians bring their own, or simply play unamplified. There are no cover charges, and all ages are welcome. We have two stages. Most shows are held in the main room, which seats about 30 with tables, or 40 chairs arranged in rows with tables removed. On warm summer nights, the garden stage is available for acoustic performances. All musicians are booked by the owners of the cafe, Marianne and David. Email them here to book a show. Art for the café is booked almost a year in advance. Every September a call for art is placed in the local papers and with the Art’s Council email group. All artists are interviewed and the 12 artists for the following year are chosen sometime in October. We generally have anywhere from 30-60 artists apply for the 11 open spots. December is reserved for our annual “Hang it All” show, which is geared toward giving the gift of art for the holidays. If you are a visual artist, contact Marianne. We also highly suggest you join Arts Obispo. 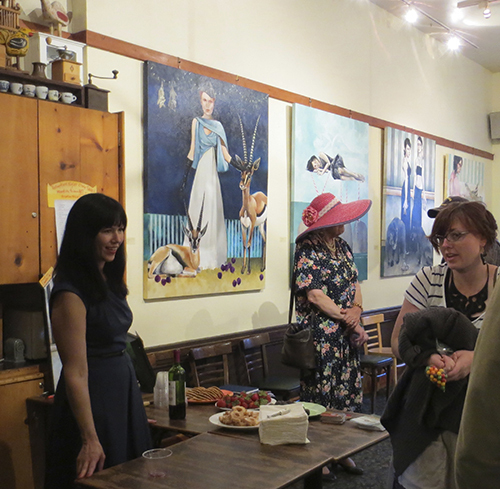 Artist receptions are always held during San Luis Obispo’s Art after Dark on the first Friday of every month.